Scientists at the National University of Ireland Galway have recently shown that the TP53 gene has even greater anti-cancer activity than previously suspected. The new study—“A role for the p53 tumour suppressor in regulating the balance between homologous recombination and non-homologous end joining”—published recently in Open Biology, provides new insight into the function of a gene long known for its importance in the suppression of cancer. 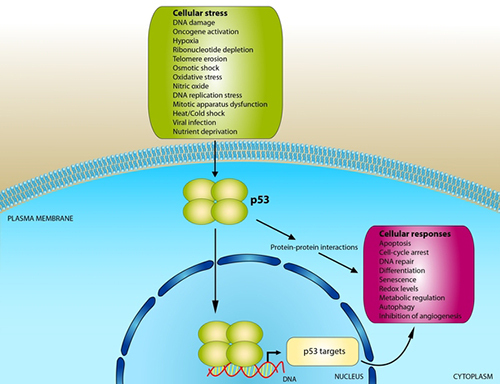 The p53 transcription factor is a critical protein involved in maintaining genomic integrity. In previous studies, investigators have shown that TP53 functions in processes that prevent cancer cells from multiplying in the body by either triggering their destruction or preventing cell division. Together, these processes are recognized as potent anti-cancer mechanisms. Specifically, the researchers found that p53 had a direct role in modifying DNA repair mechanisms. The research team is optimistic that their new insights will have an impact on the diagnosis of cancer and improve therapeutic interventions. “Our work demonstrates that TP53 directly influences the regulation of these two pathways. Thus, loss of TP53 during cancer development will drive the evolution of cancer cells towards ever more aggressive cancer types,” Dr. Lowndes concluded.